Attending 'Be Very Afraid 5' today at Bafta, it was really great to see students from schools, not necessarily known for being ICT leaders, displaying how they used technology in their school work. Organised by Professor Heppell, it is a real celebration of students using technology in a wide variety of ways as part of their school life. The range of projects was as diverse as you would expect, and their confidence as they talked non stop all day to a wide range of adult visitors was amazing. Equally with numerous film crews interviewing them all day, they showed few nerves and really wanted to explain what they were doing, how they were doing it and why they used the technology they did. Seeing learners so confident, motivated and excited about their learning is as good evidence that one could need about the value of project based learning and the value of personalised learning supported by the appropriate technology. Learners were articulate and informed , even if the night before BVA5 many were scared and worried about the event and wondered if they would know what to say. They were not 'geeks'. just individual learners who were just fab at talking about their work. Stories from attending staff were repeated about having to put 'time out' on course work late at night each day to stop students, really excited about their learning, from working. The same applied to weekends and holidays. What was also great was seeing primary age learners and discussing their projects with students from the University of Bournemouth... ages were unimportant, it was the work that was important. Be Very Afraid is a fascinating event and one that is about to go international with BVA Korea and Los Angeles next year..... with other countries joining. Students know how to do this stuff... the teachers attending supported the learners and allowed them to stretch themselves and chase their imagination. It is just so important that we encourage more to operate this way - if we did the results would be just astounding. The dimensions of the chocolate bar that arrive throught the post on Saturday caused some stress for the postman... but not my wife.. this is the biggest yet, complete with smaller chocolate bars, hats, tee shirts, pens and even a mouse mat (an interactive chocolate bar?)... but is it the biggest? The hunt seems to continue! Visiting 'Partnerships for Schools' for a meeting today in Westminster, I was deep in thought about schools as I walked past Big Ben. 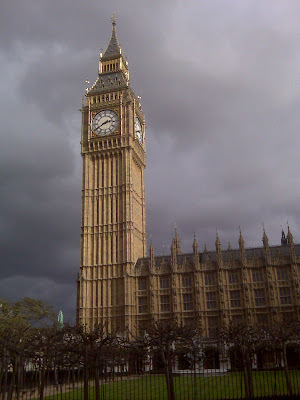 The sky was very dark and grey, Big Ben stood out as a real beacon against it. As we look for real innovation and education transformation, some are really seizing the concept of being a beacon of excellence in their areas. It is, however, very depressing to hear of some schools that have little aspiration and who are not that interested in seizing the opportunities afforded under the BSF project (Building Schools of the Future). They just want what they have now, or maybe a coat of paint in their classrooms. How will this work in ten, twenty, thirty years time......? Buildings alone do not bring about transformation, but seizing the spirit of transformational change in education and all working as a team throughout the entire process, new schools of the future, should really be education beacons of the community and provide all learners, no matter what their age, massive opportunities. The pace of change is so fast now, but there are far too many people who are not aiming anywhere near high enough! They really do need to know what is happening elsewhere to help raise aspirations - for the sake of the students of the future! It’s specific moments in life, good and bad, that can cause students to really consider their aspirations. Talking just recently to a student who, by his own admission, had spent years underachieving in school, one rather serious event really caused him to reconsider his future. From having no real plan for the future, apart from ‘being a pain in school’ (is that a plan?) he now has aspirations to be a paramedic. 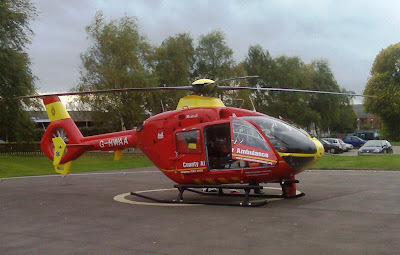 Not just any paramedic but a helicopter paramedic. It is not so much the thought of flying everywhere, which he admits would be fun but rather the challenge of helping people in possibly remote and challenging environments that had really interested him. Today he is almost completing the next stage of a paramedic course – he has changed his life. He is certain that staff in his old school would not believe it. The sad part is that he felt he had no support from school, in fact they did not even want to listen to the serious life changing moment that transformed his focus in life. He certainly isn’t going to bother to tell them now that he is achieving his goal despite them. The introduction of the personalised curriculum, and learner led interests will really help students be able to research and pursue things that interest them – things that are important and that matter. It will also encourage them to set aspirational targets and challenges for themselves and allow them the option of working to fulfil them. Not all stories are like this, but when you meet young people who have turned their life around whilst in school, it is genuinely quite moving….. but you do wonder how many don’t achieve their goal due to lack of support. Sculptures in school.... and outside. It's a small world! It's a small world... whilst being a Headteacher in London I decided to employ a resident sculptor in school for two years. Also acting as an Art technician, established sculptor Adam Reynolds ran all sorts of workshops and extra curricular activities. 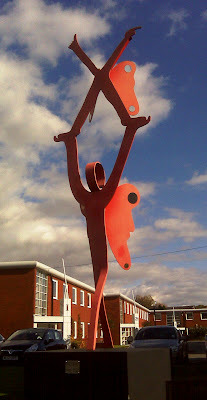 Sculpture appeared around the school, often curriculum related including a sculpture by students on synonyms, through to helping students with their art projects. Helping radically transform the school environment, Adam was also a great hit with the students. Fast forward four years later and in a totally different part of the country I now do a lot of work on 'Schools of the Future' bids in Sale, Manchester - somewhere I had never been before. Literally just yards down the road as I walked to get a sandwich I spotted a sculpture. Always interested I looked closer and discovered thast it had been created by: you guessed it - Adam. It really is a very small world! Sculpture can really play a very important part in enhancing school environments. 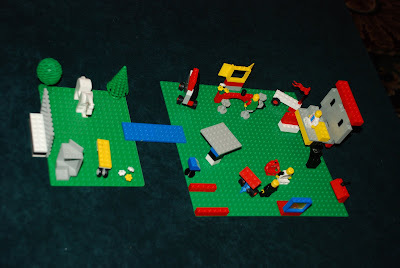 Unlike some schools that just commission it, it is so much more powerful if students design and create it, either as a curricular or extra curricular activity. Predictably of course, work designed and created by students rarely gets damaged. To see Adam's website click here. The announcement yesterday confirming the scrapping of the Key Stage 3 tests or SATS as they are lovingly known (??) is just simply very good news for students and teachers alike. It will, at last, allow teachers to concentrate on increasing the focus on teaching that is relevant and challenging for students. rather than spending a huge amount of time working towards the test. There can now be far more personalisation of the curriculum, the new national curriculum allows this with more integrated work and an increase in the variety of assessment styles that can be undertaken. SATS did not prevent these, but certainly did inhibit teacher and school focus and willingness to think outside the box because of the paranoia of league tables, targets and tests. They also became a good excuse, frankly, for those teachers nervous about exploring new learning styles, even it would engage their students more. There are a variety of reasons being put forward about this news, not least connecting it to the marking shambles that occurred this year. The 'spin' is that it is not related to this event, but a growing realisation that the time is right for students to move towards a more personalised curriculum. Whilst politicians have been saying this for years, it is the same politicians who inhibited the progress due to their obsession with testing. Whatever the political reasons, this really is good news for students and teachers. Lets now really move into the 21st century and bring on personalised learning in our schools for the sake of our students. The chairs above are very thin,colourful and when stacked don't take take much space - but are they comfortable? The whole issue of FF&E in schools is one that is, at last, being increasingly recognised as being as important as building design, ICT resources and so on. For far too long the furniture and fixtures have been not given any where near enough attention. As we build more and more new schools, finally clear innovative and exciting strategies for FF&E are now being considered. There are people really thinking carefully about what is the most appropriate furniture for a variety of learning styles, including new designs, and then establishing how it can be sourced cost effectively. 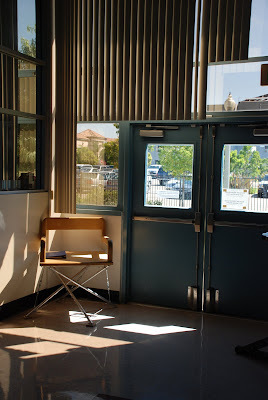 For too long schools have expected students to sit all day on economy priced chairs that are the wrong size, wrong height, or just plain inappropriate. I always despair when listening to teachers after a staff meeting or professional day when they have had to sit on these chairs for an hour and then get up moaning, stretching or talking about how uncomfortable they are. And yet they don't seem to think about the students who sit on them all day. Equally, many times I have heard students ask why teachers get comfortable chairs and they don't - good question really. Seeing the chairs in the photo above, they are very thin, are colourful, look good and a lot can stack in a small space.... but are they really appropriate for students to sit on for long periods of time? I sat on them - ergonomic that are not, comfortable maybe briefly, but all day? Decent furniture can be expensive, obviously careful sourcing strategies are needed to ensure some value. But if we expect students (and staff) to work well and effectively, we have to give them the tools to encourage them to be able to do it! Teaching girls that there are no barriers for future careers and opportunities and that they can succeed in any career is a message that can take years. Presumably therefore, this should start early. I can't help thinking that there is something wrong here, girls and train sets are fine... but pastel colours and shops seem to be preparing her for a future life of shopping - is this wise I ask my self? But there again- she is only two and she just loves it! Maybe that is all that matters. Schools are always looking for ideas for protecting students outside when it is raining.. quite an issue in the U.K really. Some schools are now beginning to find ways to cover outside areas quite creatively. 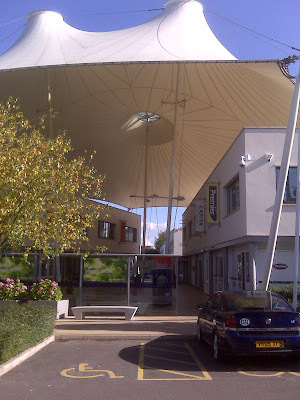 Visiting Abingdon in Oxfordshire today I happened to visit a small mall that had a really iconic tensile roof over it. This changed a potentially dull double row of shops to a dramatic and eye catching environment. The structure is obviously very durable as it has apparently lasted years. Note the glass screens at each end of the mall which do not detract from the visual appearance, but does reduce the wind from whistling down between the shops. I joined a large group of interested professionals from education, broadcast, ICT media worlds (plus more) this morning at BAFTA for a breakfast conference based on 'Learning on Gaming Platforms'. With an estimated 59% of 6 - 65 year olds in the UK being 'gamers' (BBC 2005 figures, so these are almost certainly conservative), there is clearly massive interest and potential in the technology. As was noted, those people that use technology such as Play Stations to only play games, are massively under utilising the potential of the technology. On the Sony sponsored video several education settings extolled the benefits of using PSP machines in their normal curriculum work. Crucially they talked about increased student engagement. The Bryan Review (2008) stresses the need for further research into the benefits of using gaming in education - based on what I saw today, this is something that should be done soon. Listen to students and parents - fancy doing that! 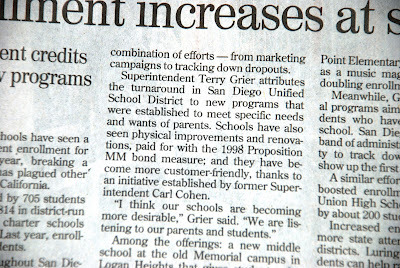 Whilst in San Diego I read a newspaper story about rising enrollments in a San Diego school district. I was really amused to read that the District Superintendent was so proud in announcing that they had introduced programmes to meet the wishes of parents, they had improved the school environment and listened to their students and generally become more customer friendly. Guess what? - when they did these things - they got better, with more people wanting to attend. The only shame is that not everyone is doing this as a matter of course, rather than it being a special initiative! It really is not rocket science is it? Just excellent student work celebrated for all to share! As a Headteacher I was always really passionate about having lots of students art work (and other subjects) around the corridors and in public places around the school. During a school visit recently I just loved seeing the real emphasis on celebrating the talents of students with non stop displays of excellent work, from fitted inside window frames through to huge pieces along corridors and in other open areas. It really celebrates students, shares their abilities with their peers and it 'lifts' areas of the learning environment. People do look examine and discuss it and very rarely interfere with it. What a great way to learn! Wide open corridors, masses of light and glass walled classrooms all add to a sense of space and give this section of High Tech High Schools a really airy feeling! 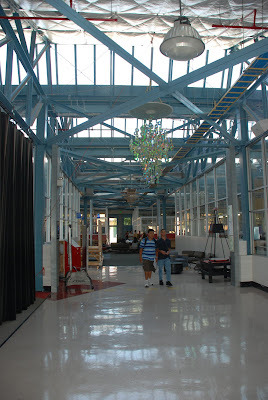 Visiting High Tech High Schools in San Diego I could not be anything but amazed at the amount of light pouring into at least a major part of the school. It was really fantastic. Talking to the students, they were all quite convinced that light should be a major part of any school design. Seeing these images, how can you not agree! 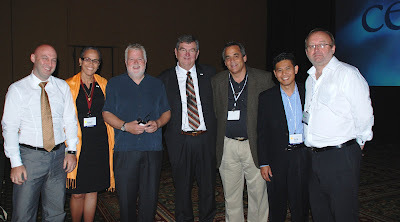 Vaughan Carter and Angela Martins of the Cayman Islands, Professor Stephen Heppell, cefpi President Merle Kirkley, Rick Dewar and Trung Le (oWp/p) and yours truely.. In any conference, a key part of the informal agenda is the networking, making contacts, catching up with news and promoting things that are good that one is associated with! Inevitably with that, come the dreaded photos..... both formal and informal. I have got to admit I prefer the informal ones any time! Even looking at these two photographs I love informal eating spaces and time for discussion and chat - work and non work combined. That's how most of us like to eat. But how often can we provide such opportunities for students in schools? Probably far more often that we think we can I suspect! Professor Heppell discussing Cayman Islands projects as part of the key note speech. 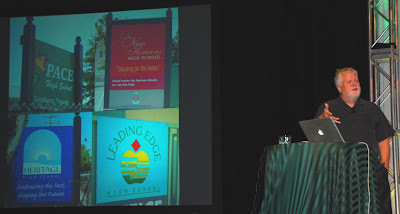 It is really quite humbling really to be part of an audience of an international education conference and have several past projects that I was deeply involved in from start to finish feted as just plain good practice. These included converting a large school to a 'schools within schools' model, international ICT connectivity between schools, the consultative process involved in stakeholder engagement for education transformation and more!! As part of his key note speech, Prof. Stephen Heppell at the Annual cefpi Conference, referred to projects all round the world. Frequently however, he came back to projects in the Cayman Islands which were part of the holistic approach to the total education transformation process. These references have caused a real stir here with literally hundreds of people from a number of countries wanting to know far more about the process and the designs for the new schools. It is important that Cayman find a way to manage all these requests for information, because, (although I am biased), it is a very important story to tell and lots want to hear it! 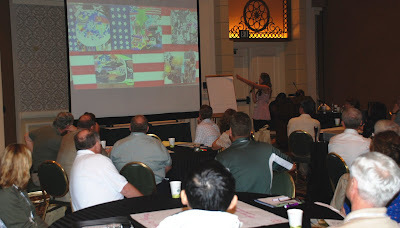 A High Tech High student explaining how she presented a project through art to reflect an exploration of her knowledge of her country. Students from High Tech High School in San Diego were certainly very clear about giving advice to school architects, facility planners and designers. 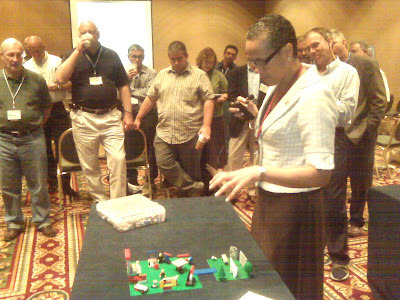 As they shared key pieces of work with the large group of professionals, stating why it was important to them, they pleaded with passion: "Please build buildings that allow them (students) to want to learn, rather than containing the learning process!" More specifically they suggested "Create somewhere relaxing and bright, so you can open the windows and see out, you know, somewhere you want to be 7 hours a day!" Makes total sense doesn't it really - they were great and very committed to learning. As I have mentioned loads of times before in this blog, students really do know how they want to learn, but just need the chance. Worryingly, in this very positive session, not all the delegates seemed to think that their message was that influential... in fact the students were far more convincing than at least one of the smaller sessions I went to! We just have to engage the students as a key part of the planing and design process - not just the selected school council members, but real representation from the whole range of the student body! 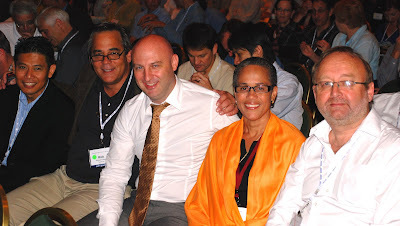 The old Cayman gang back together... high schools architects Trung Le and Rick Dewar of oWp/p, Vauighan Carter and Angela Martins of the Ministry of Education, Cayman Islands and yours truely now representing a major UK builder of 'Schools of the Future' waiting to listen to the key note speaker; Prof. Stephen Heppell. Meeting up with old colleagues is one of the benefits of attending certain conferences. 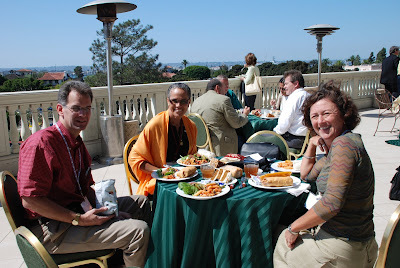 The cefpi Annual Conference, this year in San Diego, is the biggest or most relevant of its type in North America and Canada. People from all over the workd, including Australia, UK, Jordan, Dubai, Singapore, Mexico and Cayman Islands may their way to this conference to talk about nothing but schols and classrooms of the future. Rick Dewar and Trung Le of oWp/p, architects of the new Cayman Islands Campuses were present as well as the Chief Officer and Deputy Chief Officer of my old 'firm' the Ministrry of education in the Cayman Islands. Also present was Maureen O'Shaughnessy of CS&P, one of the architects of the new primary school being built, in Cayman as well as Jeff Lackney, Randy and Kris Fielding of FNI. The key note speaker for the three main days was Prof. Stephen Heppell, also invoved with the Cayman project so it really was the old gang togther again! Although the conference was very busy with 8.00a.m. session start times, there was also opportunity to relax , catch up and , inevitably share ideas and plans. Even though I have physically left Cayman, it was great to be involved in some very detailed discussions. The quality of debate and planning in the conference shows that the UK, Australia, Dubai and Cayman Islands are really at the forefront of progressive thinking in educational design and implementation. 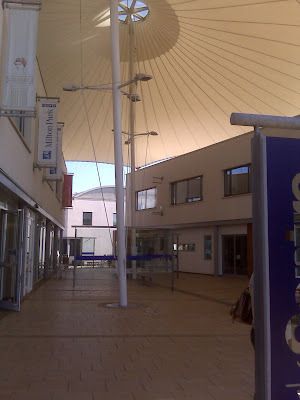 Having said that, there are some great ideas here but several that are not very innovative, just nice buildings.